Pretty Purplexing: Wacky Cleaning Lady! 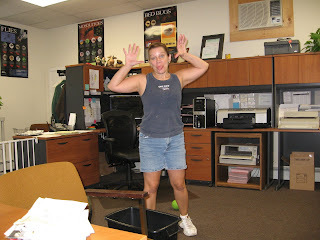 My sister, Tiffani cleans the office at our family business. I think the cleaning chemicals got to her this day!! Or has she always been this way?? heehee! wow first the hair dying pic now this one! Yes I do think I am always crazy and it is getting worse as I get older! Its strange to see someone wearing a tank top and shorts! Is it really that warm there, or were you just working really hard?